Yaks belong to the genus Bos and are therefore related to cattle (Bos primigenius species). Mitochondrial DNA analyses to determine the evolutionary history of yaks have been inconclusive. The yak may have diverged from cattle at any point between one and five million years ago, and there is some suggestion that it may be more closely related to bison than to the other members of its designated genus. Apparent close fossil relatives of the yak, such as Bos baikalensis, have been found in eastern Russia, suggesting a possible route by which yak-like ancestors of the modern American bison could have entered the Americas. The species was originally designated as Bos grunniens ("grunting ox") by Linnaeus in 1766, but this name is now generally only considered to refer to the domesticated form of the animal, with Bos mutus ("mute ox") being the preferred name for the wild species. Although some authors still consider the wild yak to be a subspecies, Bos grunniens mutus, the ICZN made an official ruling in 2003 permitting the use of the name Bos mutus for wild yaks, and this is now the more common usage. Yaks grunt and, unlike cattle, are not known to produce the characteristic bovine lowing (mooing) sound, which inspired the scientific name of the domestic yak variant, Bos grunniens (grunting bull). Nikolay Przhevalsky named the wild variant Bos mutus (silent bull), believing that it did not make a sound at all. Yak physiology is well adapted to high altitudes, having larger lungs and heart than cattle found at lower altitudes, as well as greater capacity for transporting oxygen through their blood due to the persistence of foetal haemoglobin throughout life. 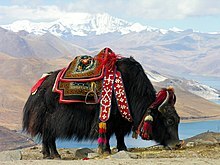 Conversely, yaks have trouble thriving at lower altitudes, and are prone to suffering from heat exhaustion above about 15 °C (59 °F). Further adaptations to the cold include a thick layer of subcutaneous fat, and an almost complete lack of functional sweat glands. Compared with domestic cattle, the rumen of yaks is unusually large, relative to the omasum. This likely allows them to consume greater quantities of low-quality food at a time, and to ferment it longer so as to extract more nutrients. 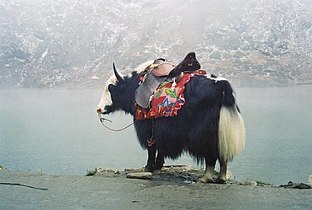 Yak consume the equivalent of 1% of their body weight daily while cattle require 3% to maintain condition. Yaks mate in the summer, typically between July and September, depending on the local environment. For the remainder of the year, many bulls wander in small bachelor groups away from the large herds, but, as the rut approaches, they become aggressive and regularly fight among each other to establish dominance. In addition to non-violent threat displays, bellowing, and scraping the ground with their horns, bull yaks also compete more directly, repeatedly charging at each other with heads lowered or sparring with their horns. Like bison, but unlike cattle, males wallow in dry soil during the rut, often while scent-marking with urine or dung. Females enter oestrus up to four times a year, and females are receptive only for a few hours in each cycle. Crosses between yaks and domestic cattle (Bos primigenius taurus) have been recorded in Chinese literature for at least 2,000 years. Successful crosses have also been recorded between yak and American bison, gaur, and banteng, generally with similar results to those produced with domestic cattle. 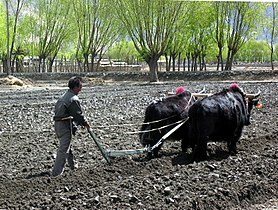 Domesticated yaks have been kept for thousands of years, primarily for their milk, fibre and meat, and as beasts of burden. Their dried droppings are an important fuel, used all over Tibet, and are often the only fuel available on the high treeless Tibetan Plateau. 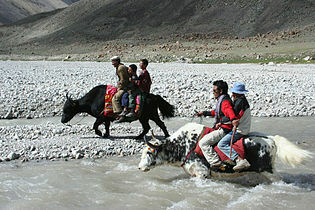 Yaks transport goods across mountain passes for local farmers and traders as well as for climbing and trekking expeditions. "Only one thing makes it hard to use yaks for long journeys in barren regions. They will not eat grain, which could be carried on the journey. They will starve unless they can be brought to a place where there is grass." They also are used to draw ploughs. Yak's milk is often processed to a cheese called chhurpi in Tibetan and Nepali languages, and byaslag in Mongolia. Butter made of yak's milk is an ingredient of the butter tea that Tibetans consume in large quantities, and is also used in lamps and made into butter sculptures used in religious festivities. 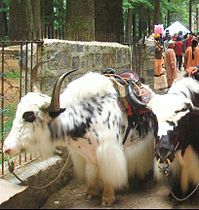 The Indian government established a dedicated centre for research into yak husbandry, the ICAR-National Research Centre on Yak, in 1989. It is located at Dirang, Arunachal Pradesh, and maintains a yak farm in the Nyukmadung area at an altitude of 2750 m above MSL. In parts of Tibet and Karakorum, yak racing is a form of entertainment at traditional festivals and is considered an important part of their culture. 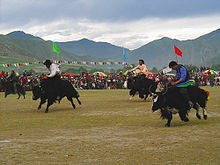 More recently, sports involving domesticated yaks, such as yak skiing or yak polo, are being marketed as tourist attractions in Central Asian countries, including in Gilgit-Baltistan, Pakistan. ^ Grubb, P. (2005). "Order Artiodactyla". In Wilson, D.E. ; Reeder, D.M (eds.). Mammal Species of the World: A Taxonomic and Geographic Reference (3rd ed.). Johns Hopkins University Press. p. 691. ISBN 978-0-8018-8221-0. OCLC 62265494. ^ Guo, S.; et al. (2006). "Taxonomic placement and origin of yaks: implications from analyses of mtDNA D-loop fragment sequences". Acta Theriologica Sinica. 26 (4): 325–330. ^ International Commission on Zoological Nomenclature (2003). "Opinion 2027. Usage of 17 specific names based on wild species which are predated by or contemporary with those based on domestic animals (Lepidoptera, Osteichthyes, Mammalia): conserved". Bulletin of Zoological Nomenclature. 60: 81–84. ^ Harris, R.B. ; Leslie, D. (2008). "Bos mutus". IUCN Red List of Threatened Species. Version 2014.2. International Union for Conservation of Nature. Retrieved 4 September 2014. ^ "The Yak. Chapter 2: Yak breeds". FAO. Retrieved 31 August 2017. ^ "ORIGINS, DOMESTICATION AND DISTRIBUTION OF YAK". www.fao.org. Retrieved 31 August 2017. ^ a b c d e Wiener, Gerald; Jianlin, Han; Ruijun, Long (2003). "4 The Yak in Relation to Its Environment", The Yak, Second Edition. Bangkok: Regional Office for Asia and the Pacific Food and Agriculture Organization of the United Nations, ISBN 92-5-104965-3. Accessed 8 August 2008. ^ Yak Dung. Sherpatrek.com. Retrieved on 2012-12-19. ^ a b Zhang, R.C. (14 December 2000). "Interspecies Hybridization between Yak, Bos taurus and Bos indicus and Reproduction of the Hybrids". In: Recent Advances in Yak Reproduction, Zhao, X.X. ; Zhang, R.C. (eds.). International Veterinary Information Service. ^ Golden Book Encyclopedia, Vol. 16 p. 1505b. Rockefeller Center, NY: Golden Press (1959). ^ Gyamtsho, Pema. "Economy of Yak Herders" (PDF). ^ Tibet and Tibetan Foods. Flavorandfortune.com. Retrieved on 2012-12-19. ^ "ICAR-National Research Centre on Yak". This page was last edited on 5 April 2019, at 14:30 (UTC).